A lot can be said about an evocative title for a game. These days the tendency is to get artsy. You get titles like The Last of Us or Remember Me, which reveal little about the game and encourage you to find out for yourself. 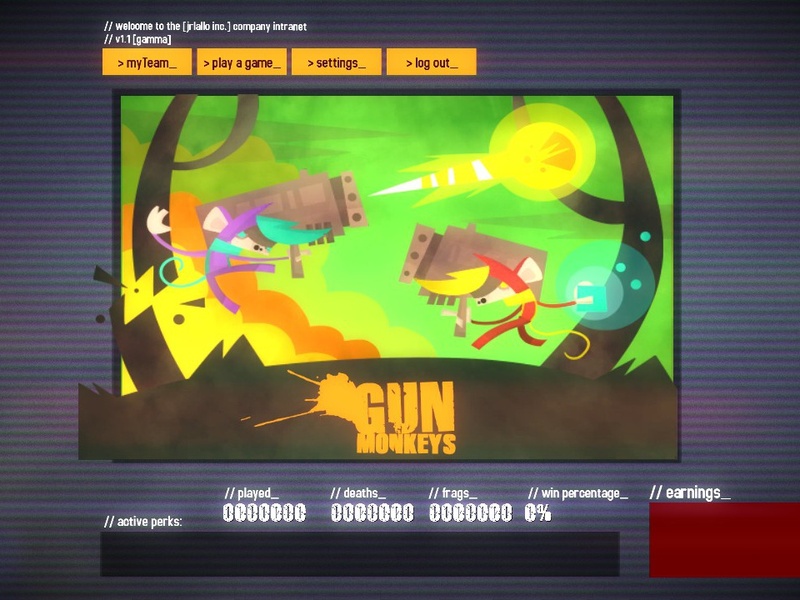 Today we are reviewing a game named Gun Monkeys. I challenge you to find a more evocative game title than that. How can you not love monkeys in diving helmets? And guns? This is a term that I’ve been using so frequently in recent reviews that its starting to make me self-conscious, but Gun Monkeys makes excellent use of stylized graphics. The levels are angular and irregular in a way that almost resemble paper cutouts. Layered on top of the simple, vector-y visuals are numerous effects. Some of them vary depending on the specific level. In icy levels, snow drifts down. In underwater levels bubbles drift up. 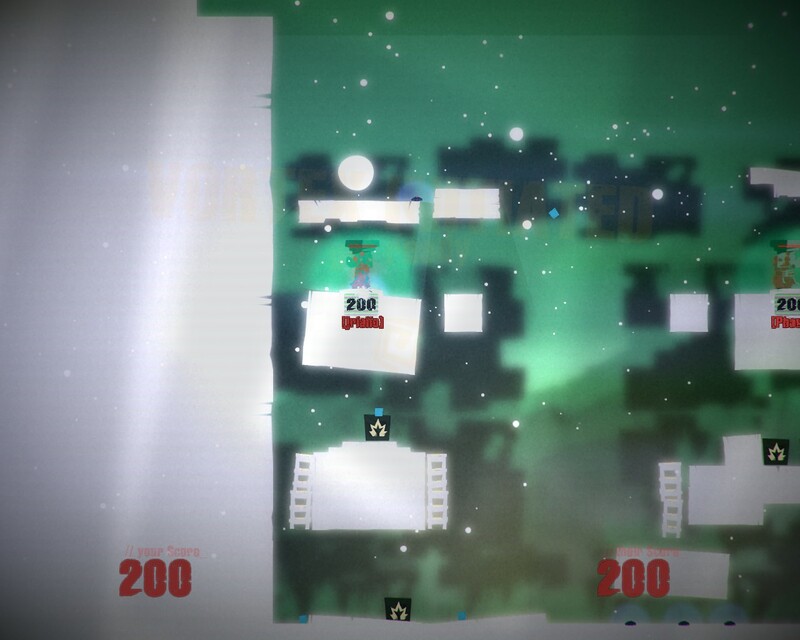 Regardless of the level, the background has a depth of field blur to it, and everything has a subtle bloom. The whole screen seems to have a noise effect applied as well. It actually is oddly reminiscent of Element4L, though in this case with a much more off-kilter personality. What’s more, the application of visual effects usually associated with realism to a world that is so utterly surreal serves to underscore the strangeness of the setting. 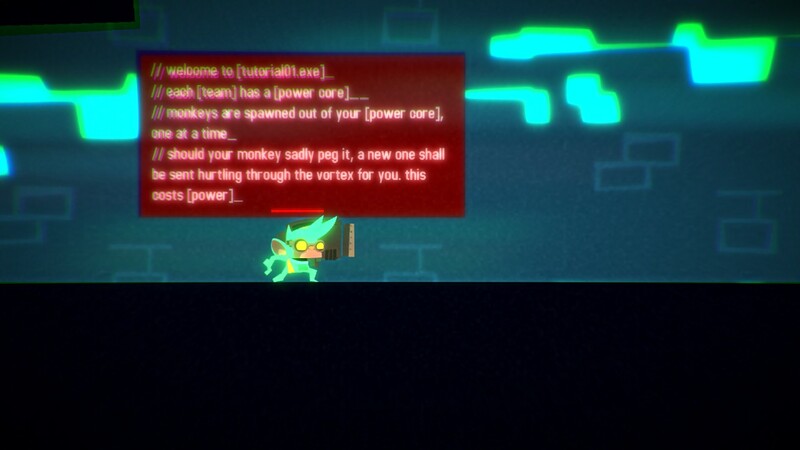 I would be remiss if I didn’t mention the monkeys, which are color-customizable and frantically dedicated to the task at hand. Cute isn’t quite the word I’d use to describe them, particularly when they get splattered into bright red blobs of blood, but they are certainly consistent with the setting. Perhaps the visual that sticks with me most from the entire game, however, is that of the new monkey being summoned to replace a defeated one. You see, the unfortunate primate doesn’t phase in all at once. First there is a skeleton, then blood, then skin, and finally accessories. From the unpleasant writhing the creature is doing through the whole process, it seems likely that time travel isn’t the most pleasant experience. Let’s see, where do we start. Well, there are monkeys and guns, so the promise of the title is immediately fulfilled. The activities of said armed simians, however are rather interesting. I’ll go onto the where and the why in the story portion, but the core of the gameplay revolves around the acquisition of little glowing cubes of energy. The players are placed on separate teams, and each team has a time portal which steadily consumes energy. The team that reaches zero first loses. Now, gathering cubes increases the energy amount, and dying decreases it, so depending on your play style, you could focus on gathering and surviving in hopes that your enemy won’t get his or her hands on enough energy to stay in the game. Alternately you could go full offense and try to wipe your enemies energy out entirely through kills. There’s the tremendous motivation to stay alive, not only because death costs you energy, but because respawning keeps you immobilized and takes time. Every second you’re grotesquely being assembled by the portal is a second your foe is free to collect energy unmolested. Never let it be said that we allowed monkeys to go unmolested. The energy you seek drops randomly through out the level, and you’ve got an appropriate amount of agility to help you reach it. You can climb ladders, crawl under low ceilings, cling to walls, and double jump. 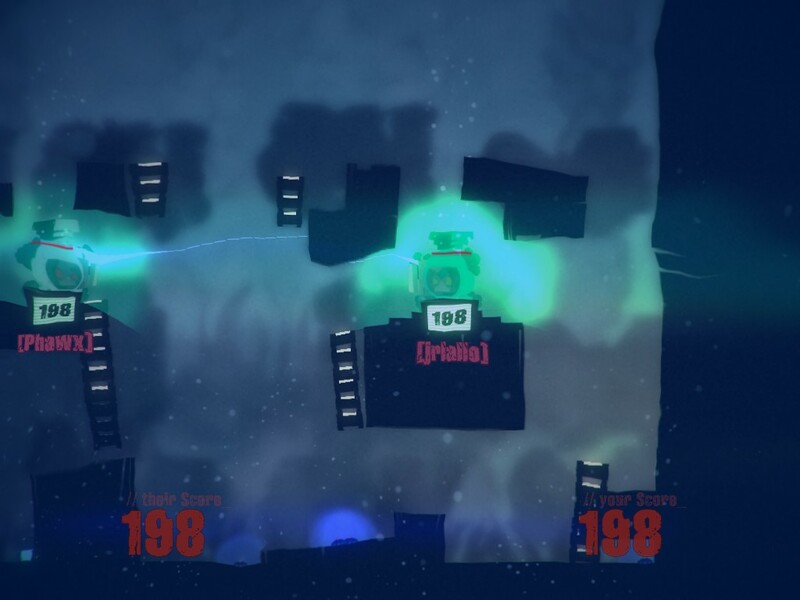 Periodically power-ups will manifest, and they are just as off the wall as the rest of the game. 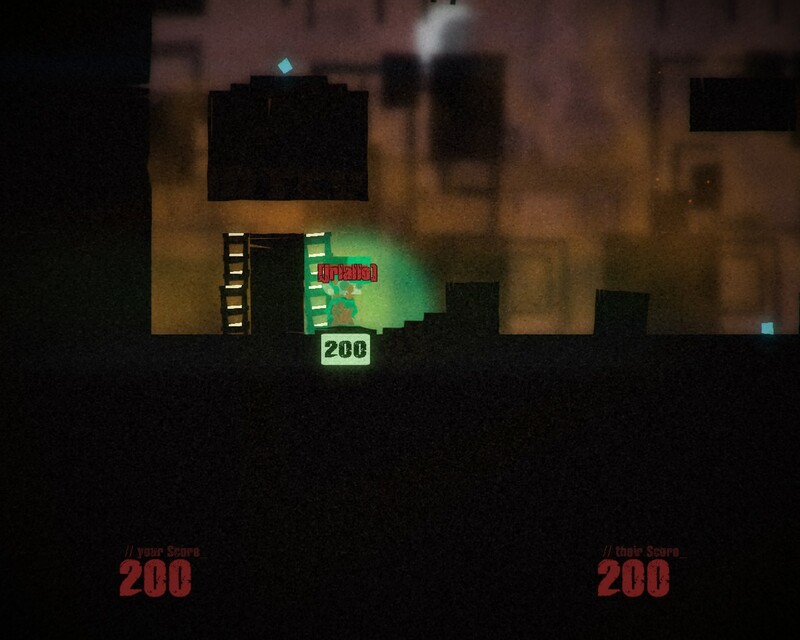 Traditional weapons like the spread gun and a homing missile launcher show off the console roots of the game, while other power-ups bestow unique abilities. One of them will alter the timescale of your enemy, making them move in slow motion. 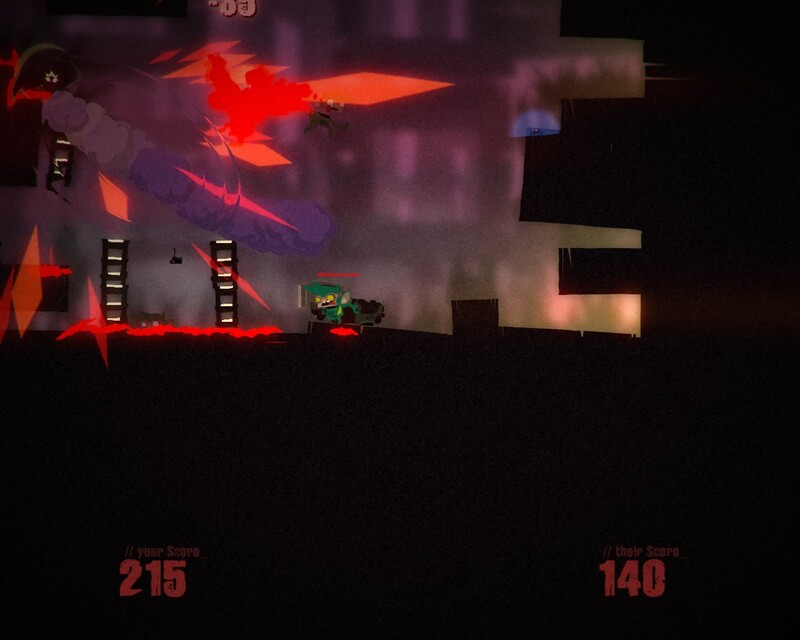 Another causes the energy cubes to move toward you and away from your enemy. 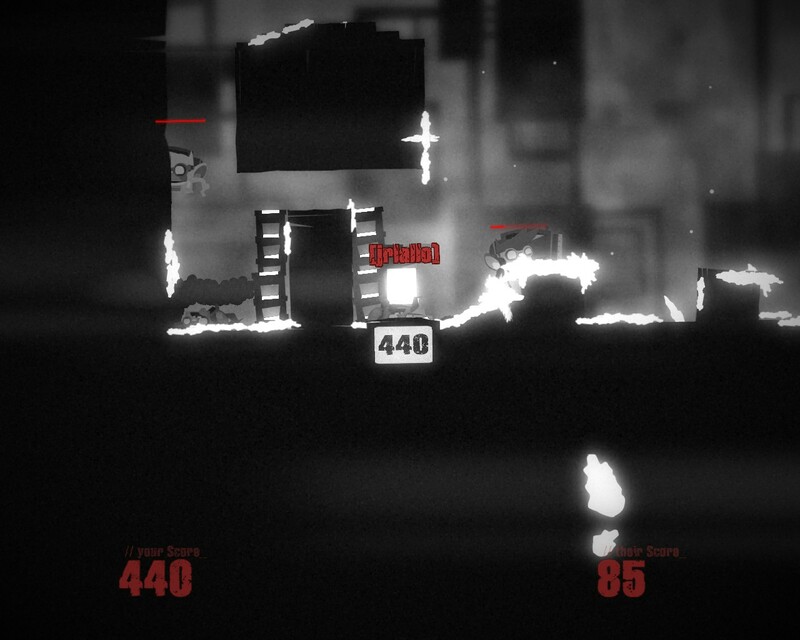 In addition to your gun, you are provided with a bomb that has a massive bomberman-style cross explosion. 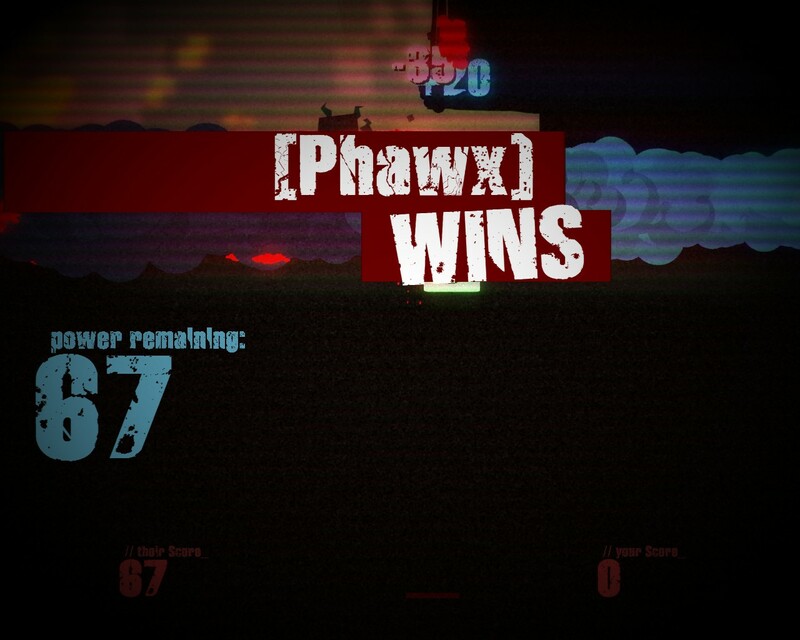 I didn’t make much use of them, but my fellow BrainLazer Phawx used them like a surgeon. By the time we’d gathered all of the review materials for this article, he was thinking three steps ahead of me, dropping bombs where I would be and killing me even if I’d already killed him. This game has the tremendous capacity to create great little moments like that, and I highly recommend talking one of your friends into picking it up if you decide to give it a try. Primarily so that you can unleash monkey-fueled death upon them, but partially because I had difficulty finding opponents at times, so it will be useful if you have a buddy to pair up with. Matches are short. They are negotiated in a lobby and based around players challenging each other, and in my experience they usually lasted only a few minutes. The winner of each match gets their remaining energy converted into dollars, which in turn can be converted to perks that give you an edge in future matches. I was partial to increased aerial control and a boosted reward for turning in a full batch of cubes. The music didn’t make much of an impression on me, but then it seldom does unless it is extremely good or extremely bad. What did make an impression on me was the voice over work. There is only one voice, and affable fellow with a British accent who helpfully explains the games story to you, as well as giving you a heads up on what each weapon and power-up does. Not only does he tell you what to expect when you pick one up, he also gives you the opposing explanation when your enemy grabs it first. His lines are cleverly written and well delivered. Most of them gave me a chuckle. You’ve got to give them credit, the devs came up with a unique story. In the future, mankind creates a perpetual energy machine. As soon as they turn it on, all of creation explodes. This, it turns out, was a successful activation. The half of existence that didn’t explode was instead converted into energy, and it all happened in the future anyway, so who cares, right? The important thing is that we harvest it. Doing so with humans would be too dangerous, so the natural choice is to arm monkeys and send them into the future to send back all of the precious juice (which may or may not be the remains of a distant descendent. What makes this story all the more entertaining is the narration by the aforementioned affable chap. He tells the story in a very straight and matter of fact way, as though it isn’t particularly strange and really nothing to worry about. He also has an obvious, active, and inexplicable dislike for the monkeys. Funny stuff. 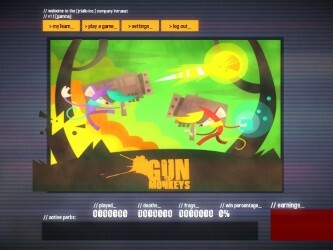 Gun Monkeys was loads of fun, and I highly recommend it. 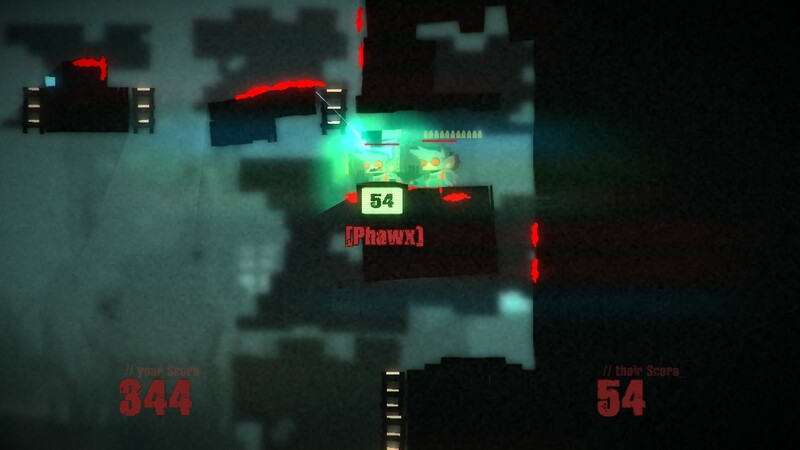 The gameplay is absurd and addictive, and the presentation is clever and entertaining. The only stumbling points for me were a slight difficulty finding matches at times, and one or two technical hiccups with the UI. 8.8 / 10: A fun and unique shooter that is great to play with friends.